Why does it smell good after a rain? Was the recent April 14, 2012 tornado outbreak forecasted? What are growing degree days? What is a heat advisory? What are those beams of light that come out of clouds? How is tornado strength determined? What is the prediction for the 2010 hurricane season? 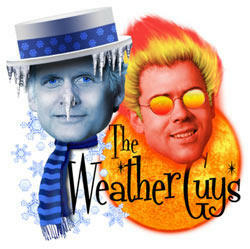 Steve Ackerman, Director of Cooperative Institute for Meteorological Satellite Studies (CIMSS) and Jon Martin, Professor of Atmospheric and Oceanic Sciences at UW-Madison, are the Weather Guys. In addition to answering your questions, they appear the last Monday of each month on Wisconsin Public Radio on the Larry Meiller Show. Have a weather question? Send an email to the Weather Guys.